First nice days of spring are wearing me out! These first actual nice days of spring are wearing me out. Of course I'm always tired when spring arrives due to the fact that I'm getting used to being outside after being cooped up all winter.I think its from the harder than average winter we've had here in Illinois, and lack of movement this winter because of it. This week has been busy with preparations for getting the garden ready and a little spring cleaning. Each fall when the garden season is over, we are so burnt out that of course things that need to be done don't get done, and get put on the back burner until they are forgotten in spring, Which means more work for our already busy schedule. But it gets me moving more which is good for gearing my rusty winter muscles into getting used to hard summer work! There are plants to be ripped out yet as well. Here is our row of sweet basil that I've started on.Even after sitting all winter, the sticks smell amazing! A welcomed sign of spring and healthy soil! The earthworms were everywhere as I pulled up the basil plants. A sign the ground is thawed and ready to be worked, Just a little more drying up needed yet.The frogs were singing one of my favorite sounds in the world today, and I got some much needed sun on my pasty white skin ha! 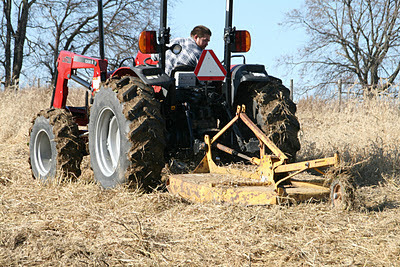 Brad is getting the new tractor greased up and ready for plowing and tilling. Hopefully we can get some early spring goodies in by the end of the week. Fingers crossed as were already behind. 2 other jobs that really should have been done in the fall. Ripping up the plastic mulch our tomatoes were on, and Our frost cover. We learned last year from our poor tomato year to never use red mulch again! 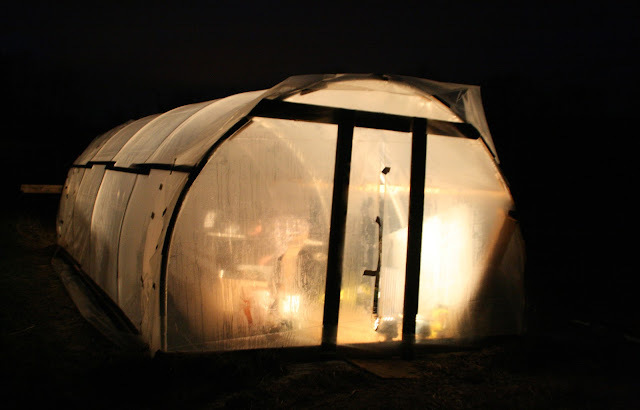 The weeds overtook as you can see and too much light got in and created the perfect growing environment (like a mini greenhouse) Black plastic mulch only this year! We have had one crazy long winter here in Illinois! With record breaking cold and snow, one day above freezing feels good enough for me to go out without my coveralls on. I'm craving spring! 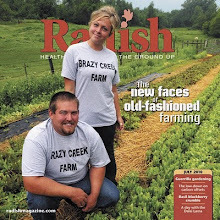 Usually by this time of year we are plating our first spring radishes and greens. But I couldn't stand it anymore, The hell with winter, I'm ready to hang laundry on the line, snow still on the ground and all. So I did. and the smell was amazing, and I slept like a baby! I'ts the busy time of year for us. 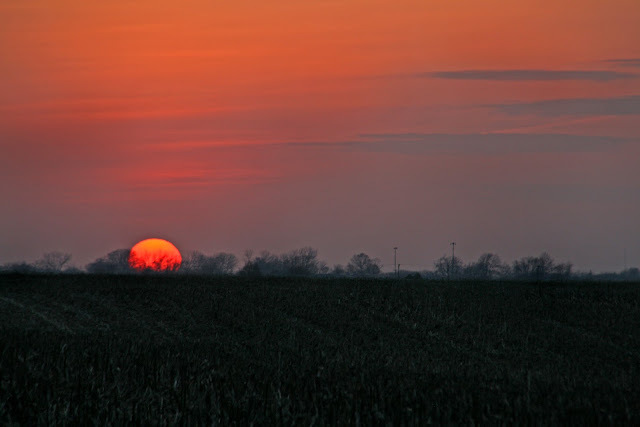 Even though the weather hasn't been Ideal for springtime in the midwest, I cannot complain as we have had plenty of rain, which makes me happy compared to last years drought. So we have been trying to get things done while dodging the cold and wet. 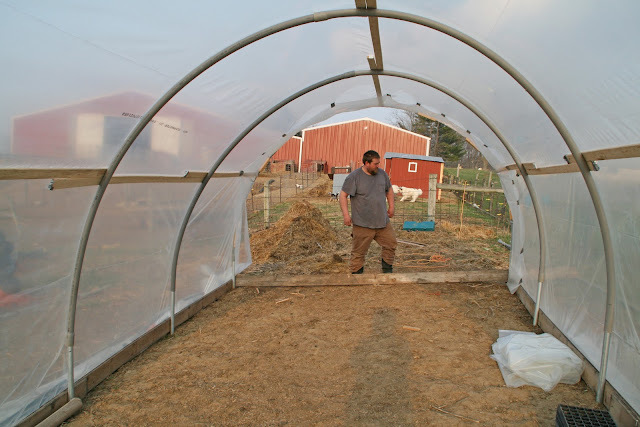 The spring garden has been tilled and most has been planted, we got a makeshift hoop greenhouse up to start our plants,The goats have had their babies, and trying to fit house hunting in the mix makes for a busy and stressfull spring. And here are a few photo of our busy month.. 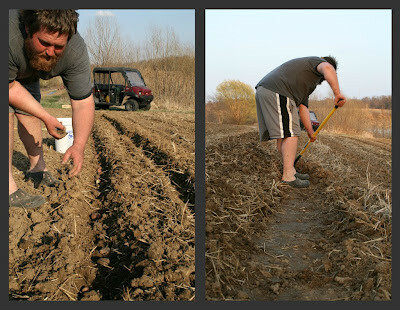 Planting Spring goodies, A good feeling to get things planted. 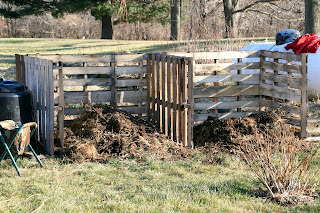 Nothing better after being cooped up all winter than to smell the fresh spring dirt, It smelled amazing! Planting day was a good one, And it ended with this amazing sunset! 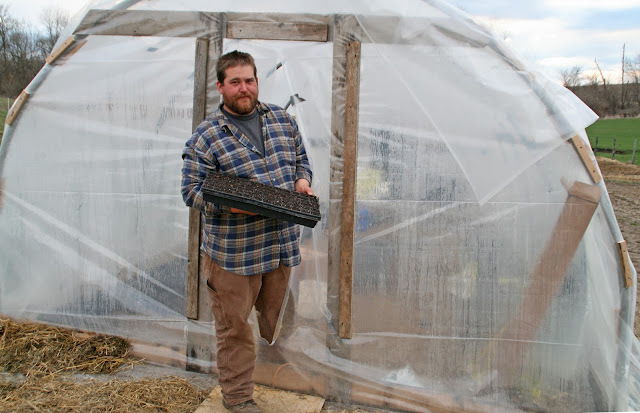 Brad constructing the hoop greenhouse. I'ts working out wonderfully! Since we are behind on starting tomato plants, we planted throughout the night. 2,000 Tomato plants started so far, A couple hundred cabbages, Peppers, Thai and sweet Basil, and more to come. We will be selling tomato plants this year, So more planting to be done! 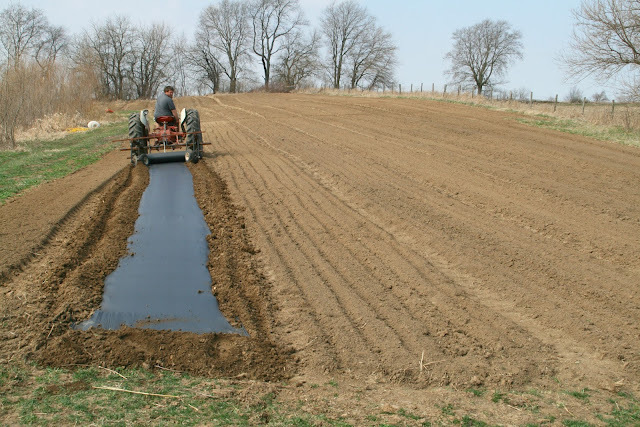 I'ts been getting pretty hot in the hoop, A little too hot to be planting in there. So Most of the planting is done in the evening or when it's cloudy out. 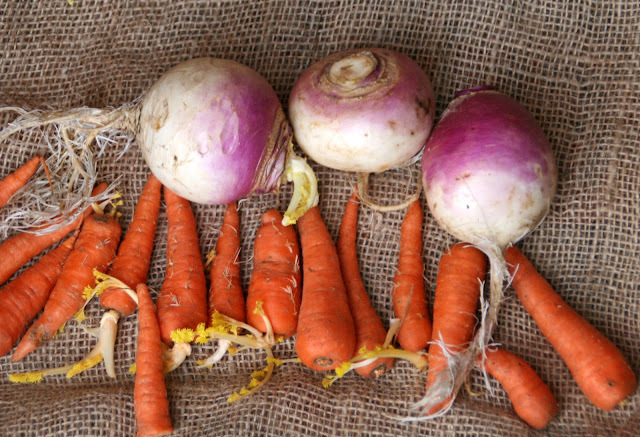 We have finally used up most of our winter storage root Veggies for dinner in a veggie soup. 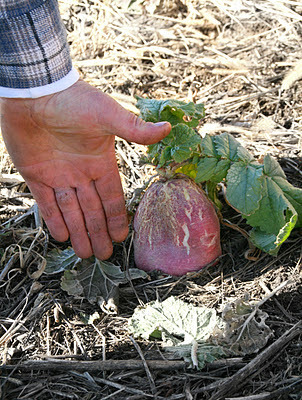 Which included Turnips,Carrots,Daikon radishes and Spinach. I must say its so nice to be able to have some veggies from our garden stored for winter use. 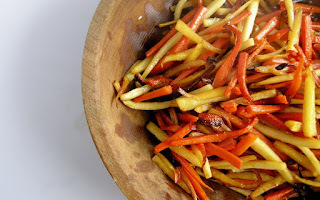 There is no comparison in flavor to a sweet crunchy homegrown carrot to the store bought flavorless ones.And I love using Turnips in replacment of potatoes. This year I hope to store more carrots in for winter use. They all kept so nice in the fridge and are still growing! 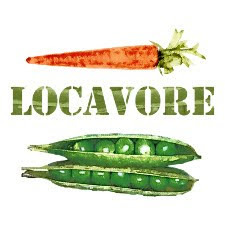 Fresh live food in winter from our summer garden. Amazing! 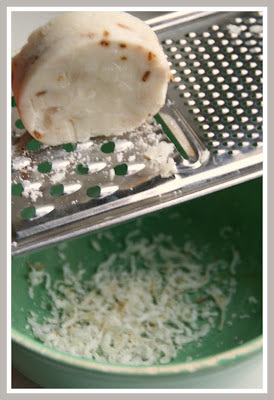 Here is a recipe I wanted to share from" Nourished Kitchen". I hope to try this soon. Sounds so good! Buuurrrrrr we are getting an arctic blast here in Illinois. With wind chills of -20 below, doing chores this morning wasn't as pleasant as usually. 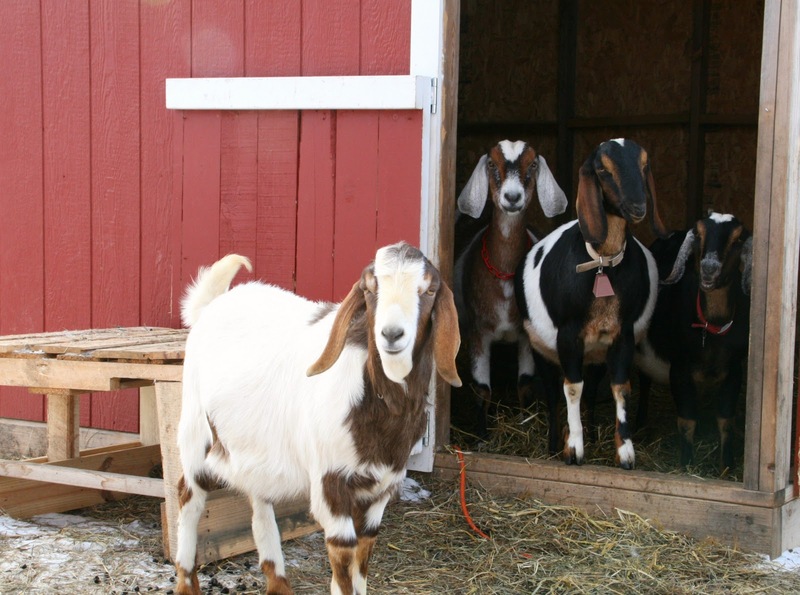 A few animals had to be moved to different buildings as once warm spots are now fridged cold. 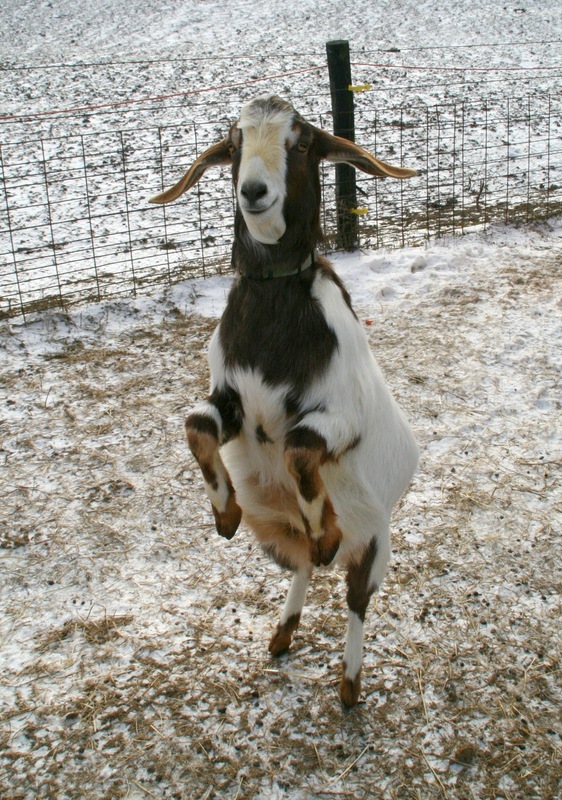 I'ts 10:27 here this morning as I type this and I have already been outside several times to check on the goats to make sure they are staying warm. 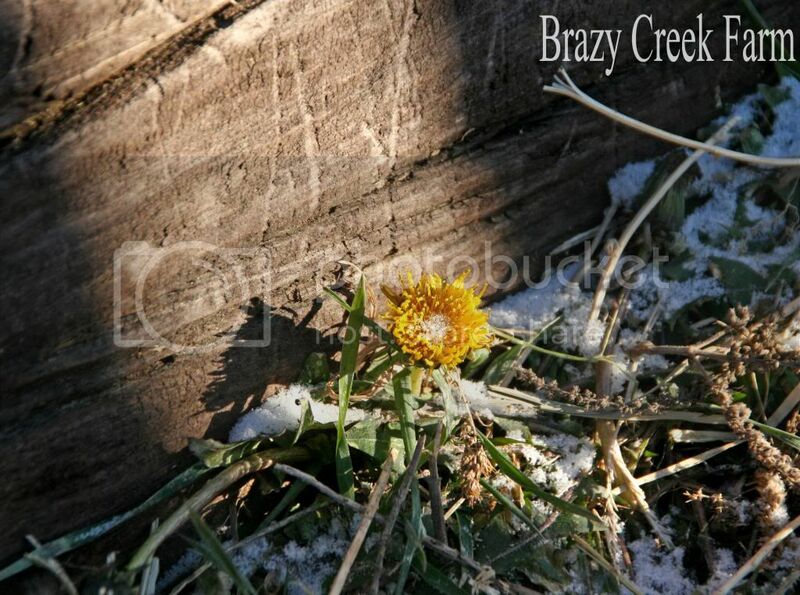 As I was walking to the goat barn I noticed this little Dandelion... I don't think I've ever seen a dadelion getting ready to bloom in the middle of Janurary! We have had some wacky weather that's for sure! Poor flower almost looked like it was trying to warm up in ray of sunlight. 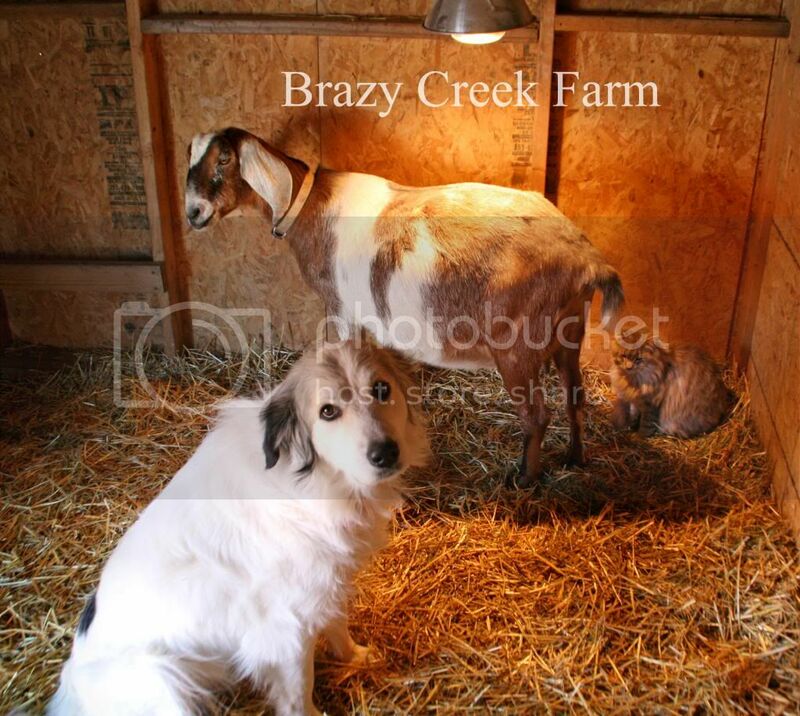 Bella, Mille, and Henry the cat are staying nice and cozy under the heat lamp. Its really not that bad if your out of the wicked winds! Some have asked where I have been since the last time I blogged, Which was along time ago. I'm still here lol. With so many projects on my mind and during the busy garden season sometimes Blogging gets pushed aside. So a little farm update for you all. 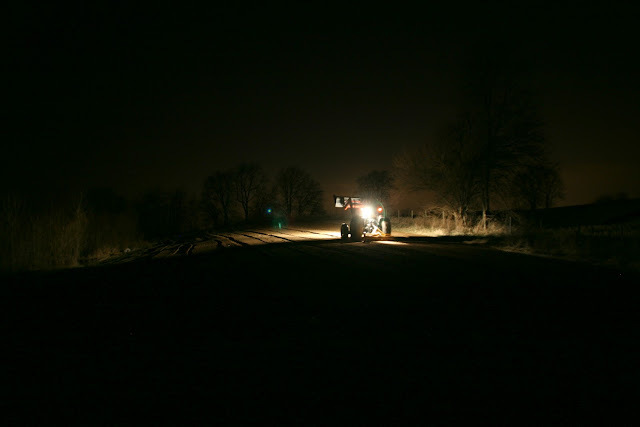 Here on the farm we have been getting things ready for a cold snap that is to come the 3rd week Of January. Getting a new door on my goat kidding stall and getting ready for the babies to arrive. Putting heat lamps up and getting the chick boxes cleaned up and organized for new peeps in a couple weeks. 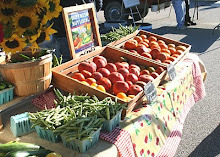 Deciding on what varieties of veggies we will be growing this year and getting seed orders in. We are also in the process of putting a hoop house up for starting tomato plants and for extending our season. Even though its still cold and winter here, this is the time of year when our winter break starts to turn into thoughts and projects that spring brings. And if feels good! Gets your mind working again and out of that hibernation feeling. 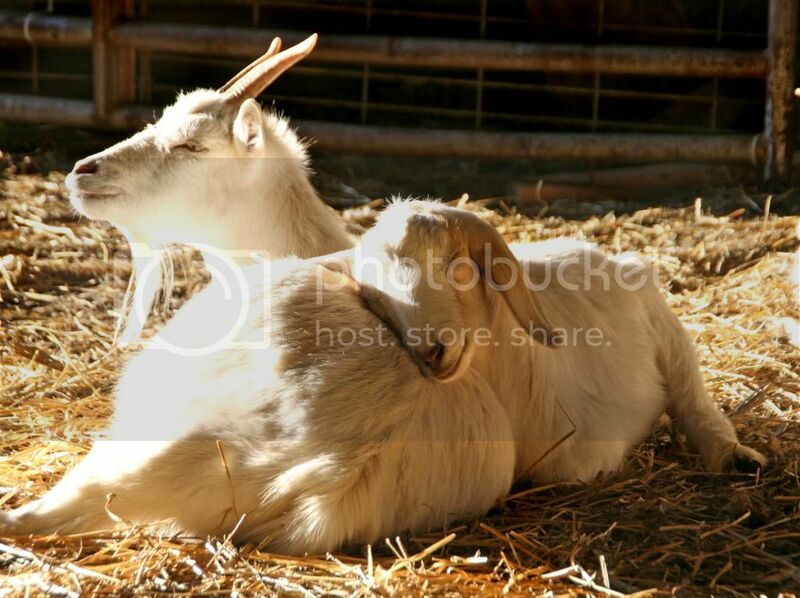 Here are a few pics from the barn.This time of year the animals always find the sunny spot in the barn to warm up. 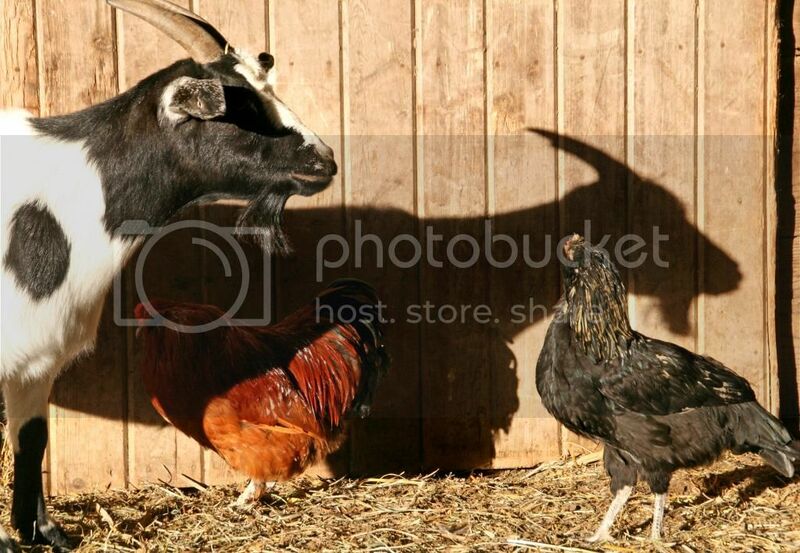 Its funny the chicken looks as though he is looking at the shadow. 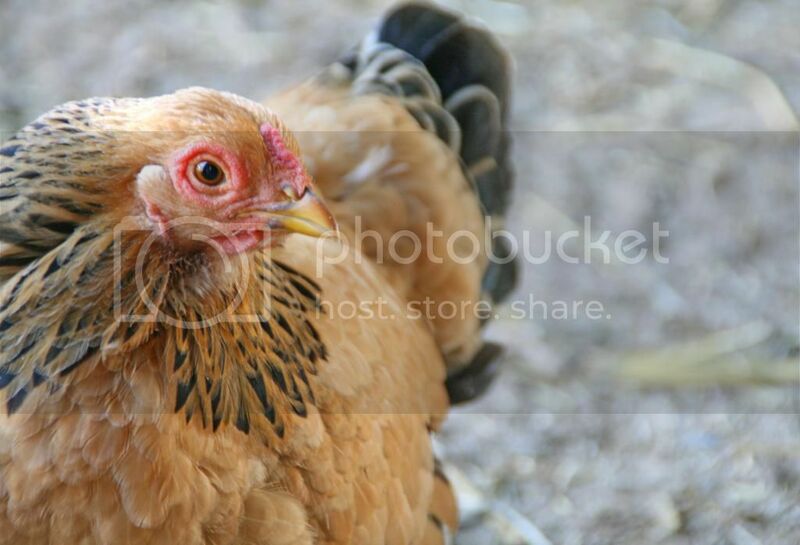 And this pretty little girl, who prefers to hang around the barn instead of her coop. With all the record breaking warm Temps here in Illinois It has allowed us to get a head start on the planting season. I don't think I've ever been Tan in March, Maybe a sunburn But not a good base tan. The weather may be weird but we sure are enjoying it. 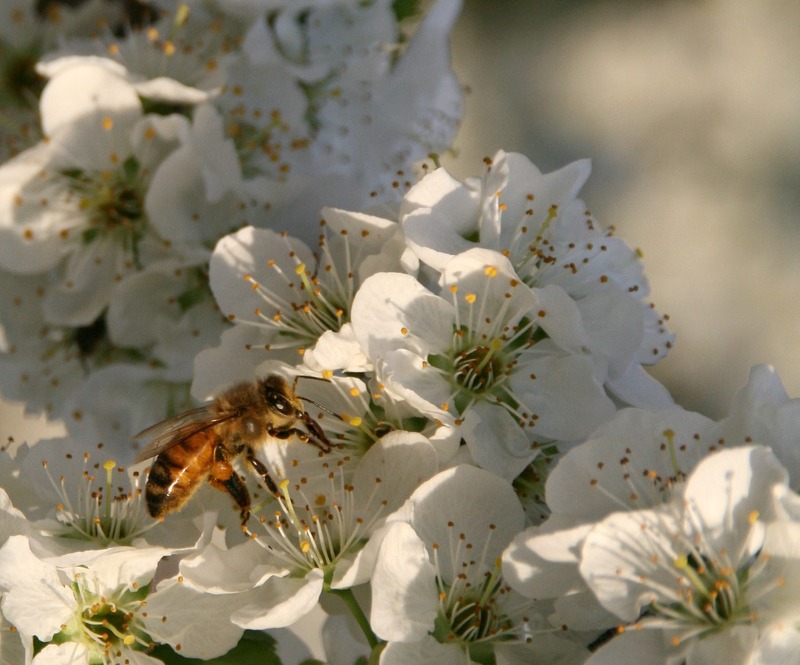 The fruit tree's are in bloom, My Zinnia's are up, The honey bee's are pollinating, and the cold weather spring crops are in the ground. Life is good! We may even get some early green beans in the ground. Here are some pictures of our busy week. Tilling the garden started in the morning and ended at 10:00 at night! 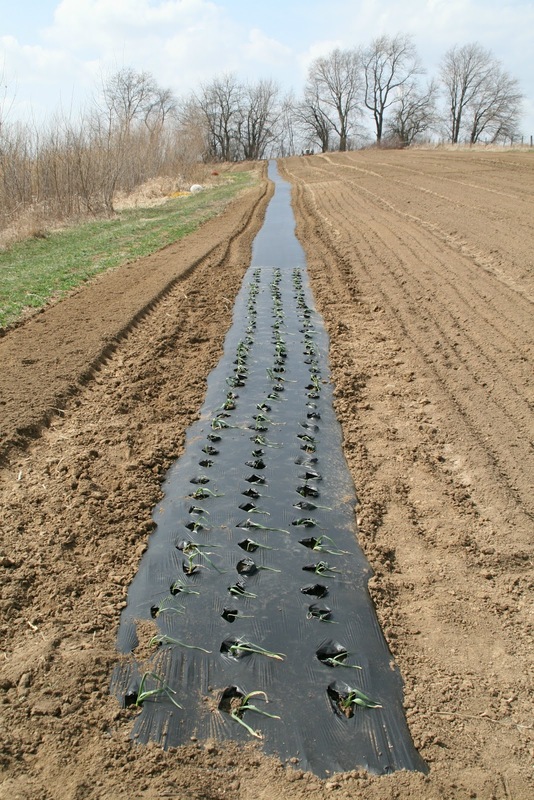 (we didn't plant on black plastic) So I started the process of transplanting them onto our newly plastic row. Hopefully we actually get some garlic this year! Black plastic is the way to go when its only two of us trying to keep up with all the weeding! While I transplanted the garlic Brad got in a bunch of other veggies such as, Radishes,turnips,beets,lettuce,spinach,arugula,Kale,Swiss chard,carrots, and I'm sure I'm missing a few others but my mind has gone blank LOL. Early potato's, My favorite! We took turns trenching and hilling a 200 foot row by hand. A lot, lot more needs to go in. 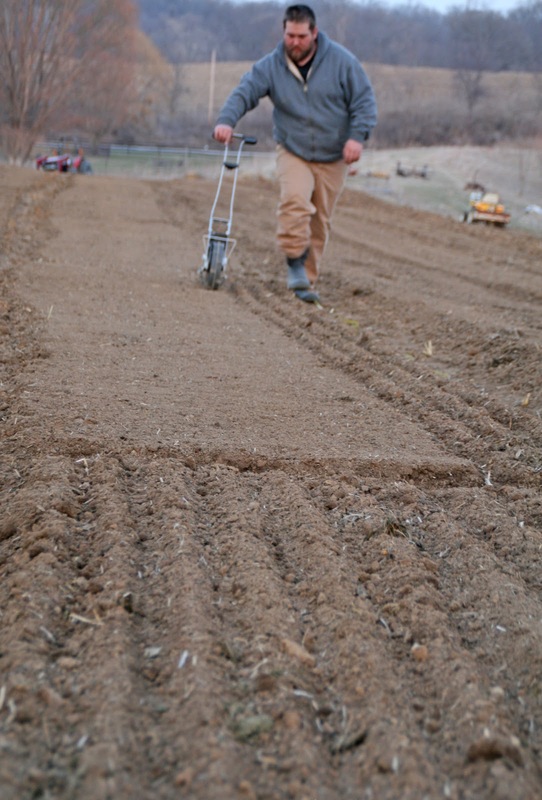 But Since we are doing it by hand this year I am glad we are doing it a little bit at a time. Our plum tree was filled with bee's and butterflies. It was magical! Makes me wish our bee order for our new hive was coming sooner. I hope with all that is in bloom so early, that we have a awesome honey harvest for our first year! 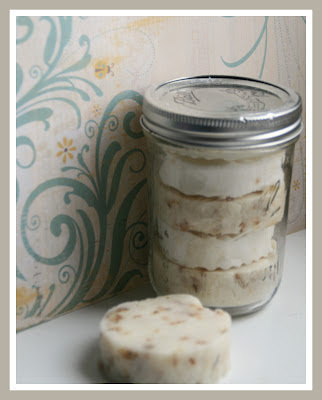 Here is a easy way to make your own body wash from bar soap. I used 2 bars from our own homemade soap. Its super easy! You can use any bar soap, I had some of our Lavender on hand and added some Milk and Honey soap fragrance to it. You can also use a essential oil or leave it plain as well. I used two of these round Bars, Around 2.5oz each. 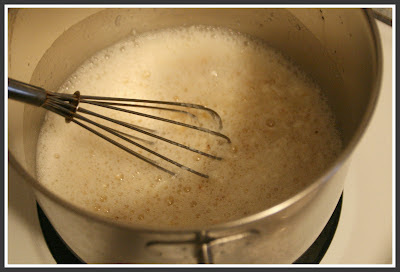 Put the soap shavings into a saucepan, Add 1 1/2 to 2 cups of water depending on the desired consistency you would like. Melt over medium low heat stirring constantly.When the soap shavings are melted you can now add your fragrance or essential oil. Let the liquid soap cool for 20 minutes, If its to thick you can heat it back up and add more water. 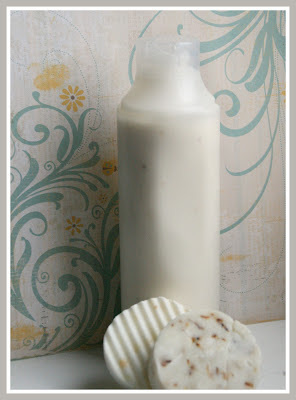 When cooled you can funnel the soap into whatever bottle you would like. I used a shampoo bottle. This is a great way to make your own body wash without all the added chemicals and unknown ingredients in the store brands.And it smells yummy! 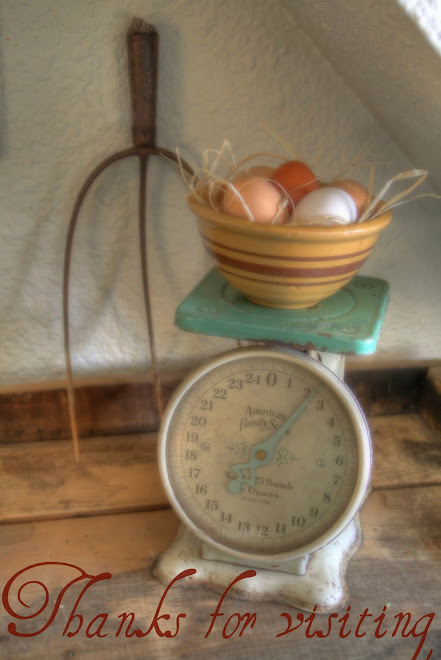 Here is a great contest for all the garden and chicken lovers. I really want to see this book! 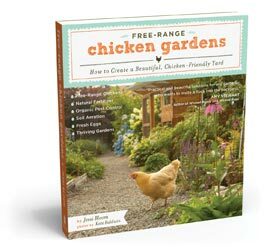 Since I would like to know what there inputs on keeping chickens free ranged in a garden are. Mine always seem to devour everything in sight LOL. 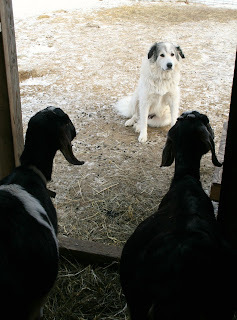 It's a cold day here today.Most the animals have decided to stay in the barn where it's nice and cozy. The only critters you will see outside are the dogs and the sheep, since they both cannot feel the cold much.So this gave me an opportunity to snap a few pictures as I was walking around the farm. Its Lambing season soon.This Ewe had only one baby a few days ago. 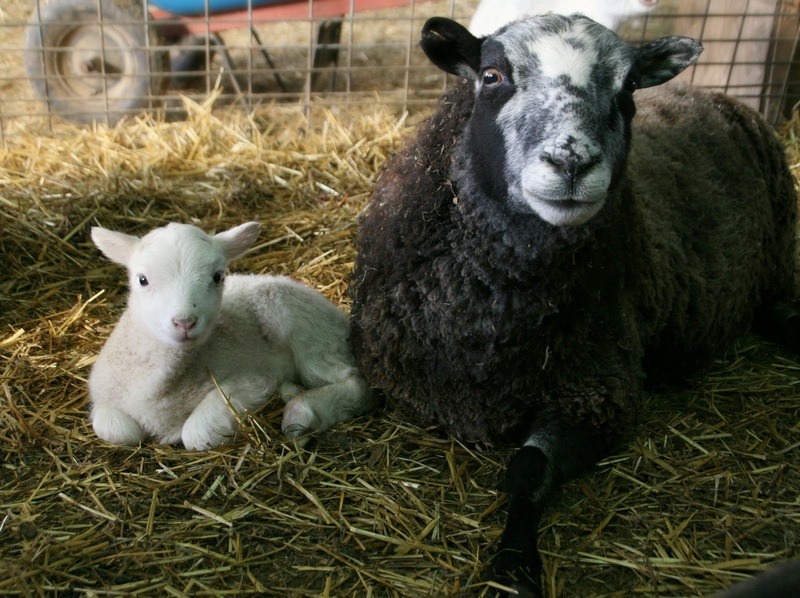 Twins are more common.These are Jacobs sheep, They are usually spotted or have patches of black or brown. Usually we get one or two all white lambs out of 60 or so babies. I love the white babies, They remind me of the Snuggle bear. 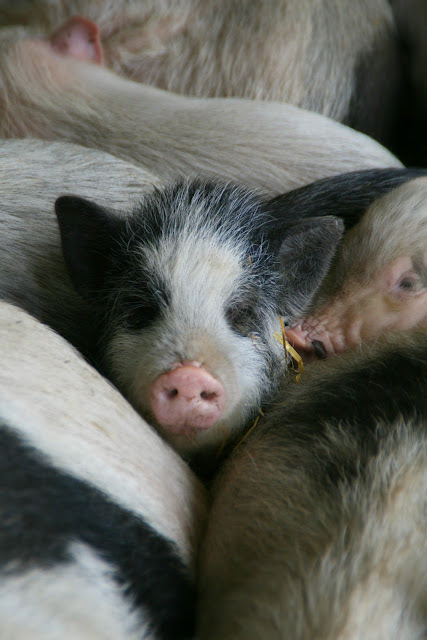 This is how pigs stay warm. 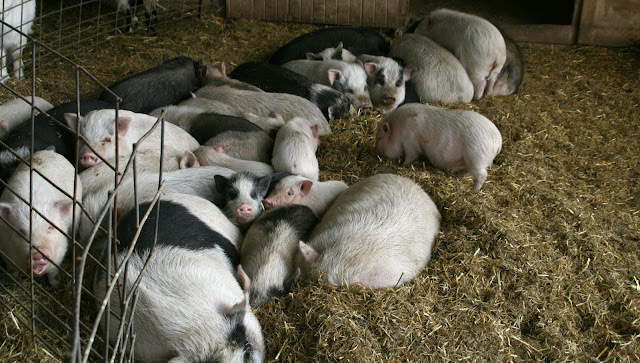 These are the Pot Belly pigs. Don't they look cozy all snuggled up together? 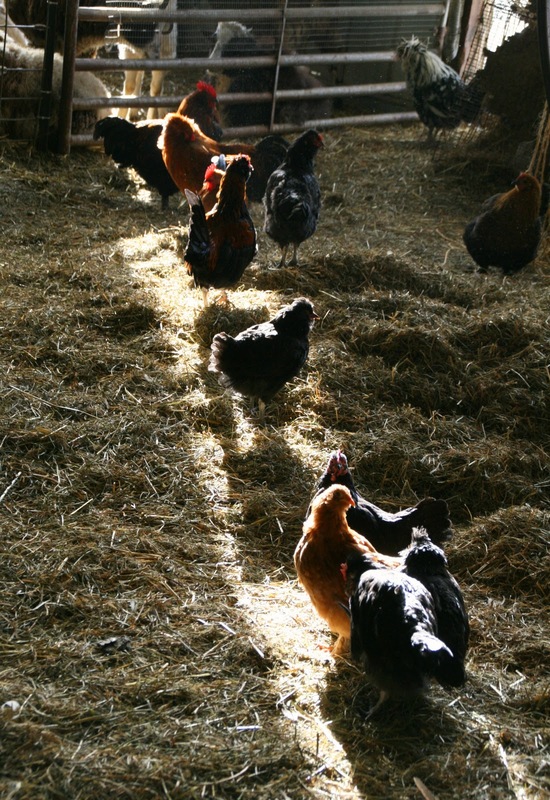 The chickens were all lined up in a row, They were trying to keep warm in this little bit of sun coming through the barn doors. It's too cold for Josie and Elle May, So they peek outside. The cold doesn't seem to bother Bella. Notice their Fat bellies. They are due to kid in a few weeks. 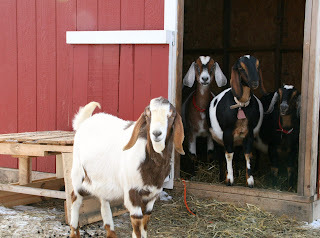 Alex our Mini Nubian Buck and the girls, minus Lily and Violet who were hiding. Alex is a silly boy. He loves to play with me whenever I come in the pen. This might not be a good habit to start with him but he cracks me up and he is a harmless sweet boy. He is a Ham, But what Buck isn't. That's why I love them so much. Ive been going outside several times a day to check on Josie and Elle. They are Due February 22nd. I think Alex may have gotten to them earlier, as they are showing signs that it may be closer than what I thought. 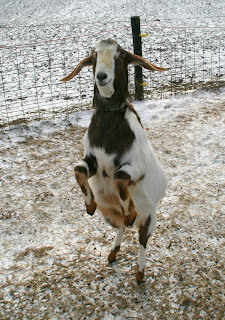 I cannot wait for cute Lil Mini Nubian floppy eared babies! I love the idea of reusing and recycling everyone's so called garbage into something useful and at the same time saving us tons of money.Ive been known to garbage pick, and stop on the side of the road when I see an old window or something useful. While I was browsing around on the black hole called "Pinterest" The site of distraction – sucking me into its greatness for hours on end. 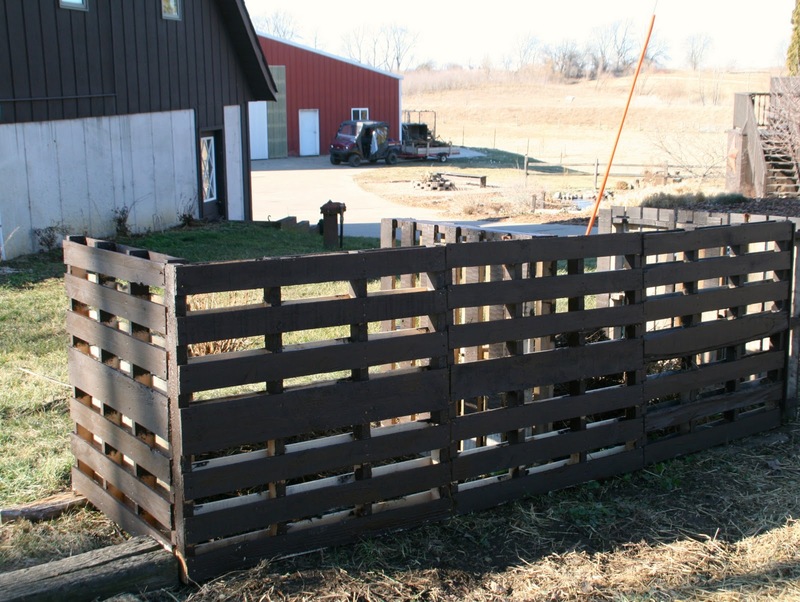 I stumbled upon a bunch of photo's of people reusing and recycling Pallets into pure awesomeness. And with projects that never seem to end around here and a very tight budget, we began our search for these useful pieces of greatness. So we scored big time and brought home a trailer full of Pallets. we have a few projects in mind. 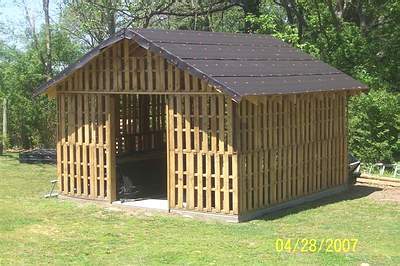 *Next is a milk shed, Since my doe's are due in a month I will need a place to milk them. *And the 3rd and biggest project is a pallet greenhouse. 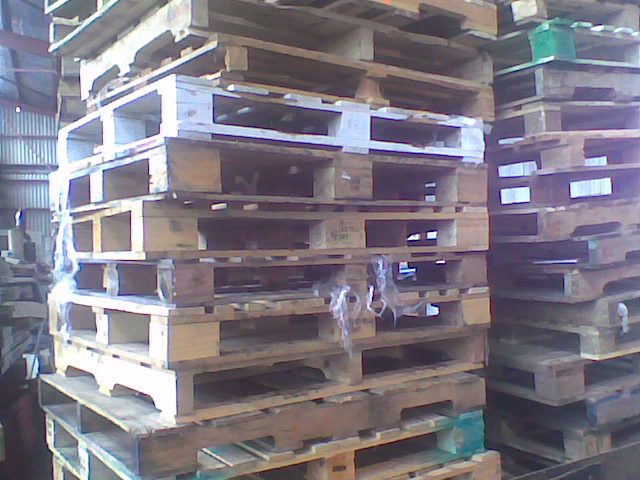 So instead of buying wood we vow to save as many pallets from the landfill as we can. I will be putting up the finished projects on the blog as they are finished because "man time" as I call it is precious around here, and we never seem to have enough of it. Brad is a working machine and I can only do so much without a man around lol. 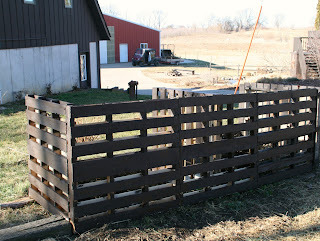 So here is the simple Pallet compost bins done with 5 pallets joined with L brackets and screws. This was so easy that my mom and I were able to just slap it together. And with this Oddly warm January weather we were able to do this. And paint it!! Never have I said I was able to paint outside in the middle of a Midwestern winter! This is the front side facing the road. We stained it to match. Next is the milking shed which we have started on already. Pics to come! This story starts about A month ago. We had around 8 geese we took in to be processed, My mom decided to keep the one pretty looking white goose for breeding. I appropriately named her Gurdie, Since she looks like a Gurdie to me. Gurdie roamed around sadly for a few days missing her siblings, which made me feel pretty horrible for taking the others in. After all Geese are smarter creatures than what most people believe. They all have their own personalities and pet like traits, unlike chickens and other barn yard poultry. After a little while we noticed Gurdie following Kip everywhere he went. At first we though she was being territorial or maybe didn't like Kip. Since Gurdie used to be kind of temperamental when she was with her clan. Since she has been alone she has calmed down a lot and has become more sociable. I think we knew they had become friends when every time Kip would bark (which is very often) Gurdie would do her goosey honk. She follows him everywhere all the time now. Its pretty entertaining watching them throughout the day. 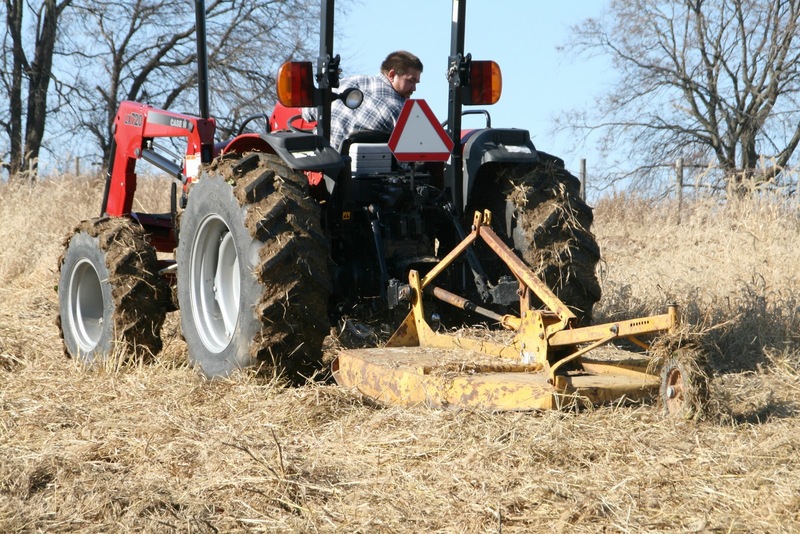 So much has to be done around the farm that has been put off or we haven't found the time for before the snow flies.So Brad took the day off today and we got some much needed work done. 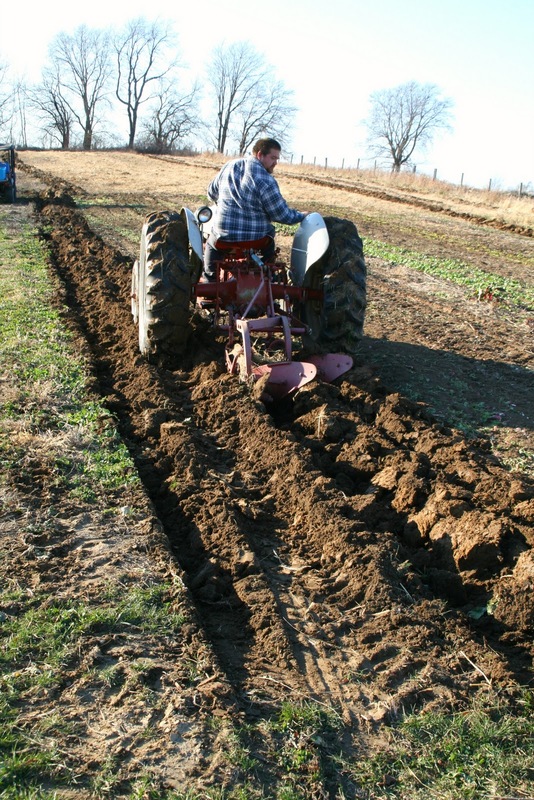 The garden has been mowed and plowed, Plastic has been pulled, Potatoes dug, The rest of the Arugula and Swiss chard picked and done! 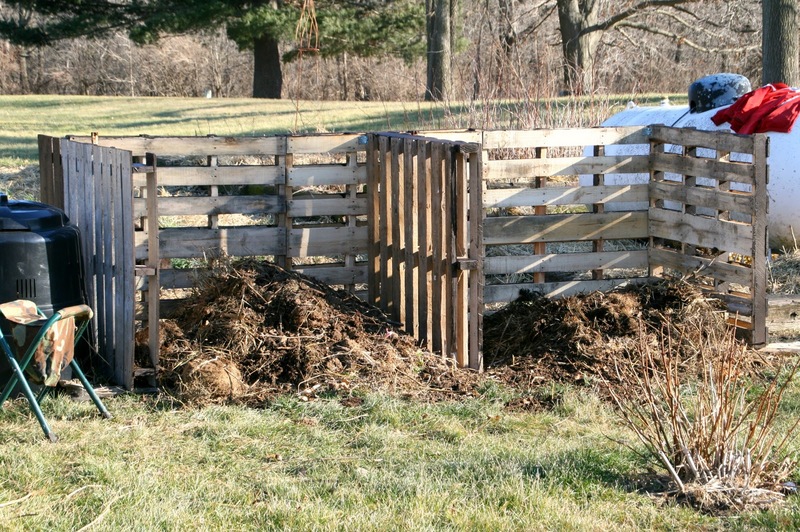 Now all we have to do is spread some manure and everything is finished for the year in the garden. Mowing was first on the list. Our garden was a grass field. We have had several complaints from conventional farmers telling us we needed to spray. I just say I don't mind picking in the weeds, Plus its is so pretty in the fall LOL I actually use the grass as centerpieces and its beautiful! The plastic needed pulling. I don't like the idea of using so much plastic but there is no way we could do without it! It keeps the plants from being overwhelmed with weeds in the summer and it also keeps the bugs at bay some since the plastic heats up.We have found dead cucumber beetles on it from the summer sun. Awesome! Plowing was a chore today actually. I think we may need to upgrade to a bigger one. 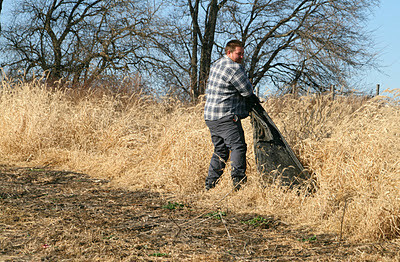 The grass kept getting stuck in it today, requiring Brad to stop every 20 feet or so to be cleaned out. To my surprise I found some broccoli left that was hidden in the weeds. 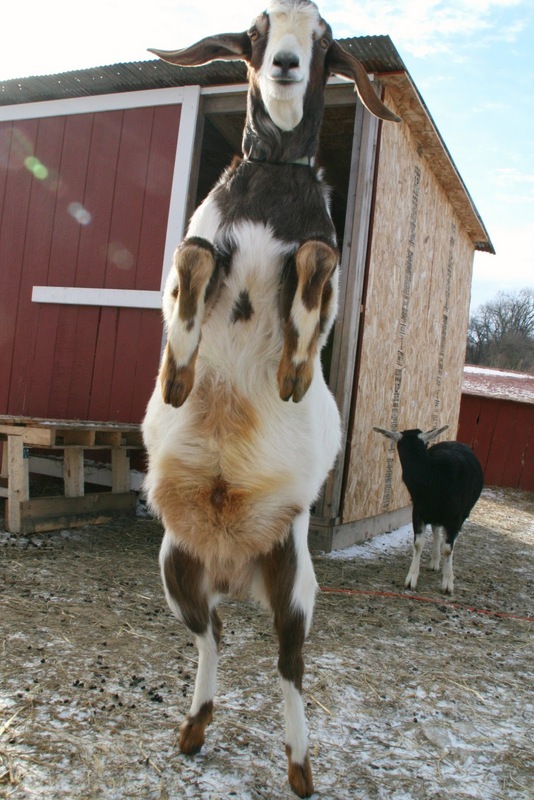 I kept the greens for the goats and chomped on the heads while working. 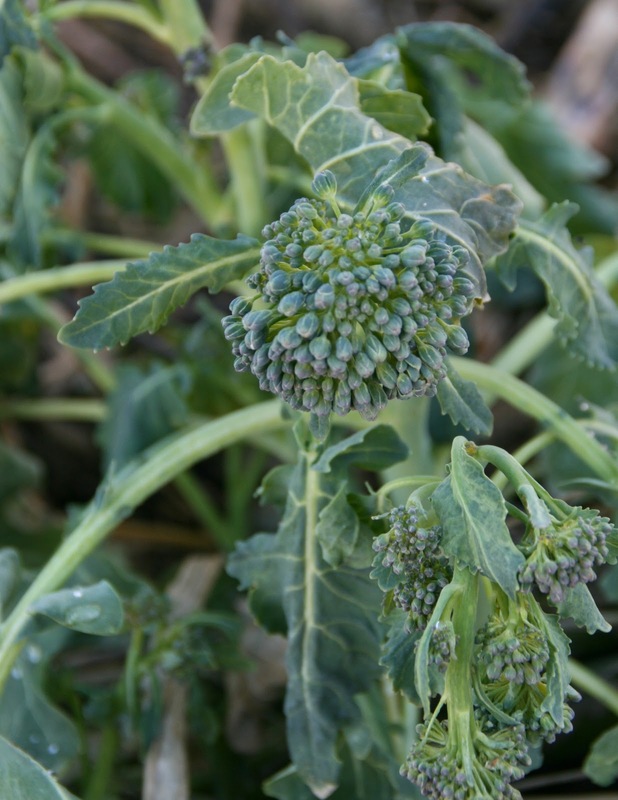 I must say this was some of the best broccoli Ive tasted, I'm sure the frost had something to do with that. It was so so sweet! even though it was a little past ripe. The best tasting spinach ever! 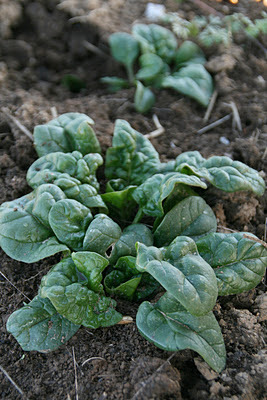 They say it gets sweeter and better after a frost.This spinach tasted like a sweet almond, Exactly! Amazing! 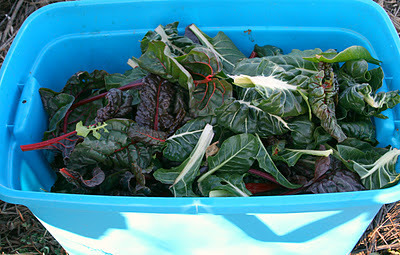 We harvested the rest of the Swiss chard and arugula for ourselves. Surprisingly it grew back pretty fast in this cold weather.This is a lot of Chard. Maybe I will make soup with it. 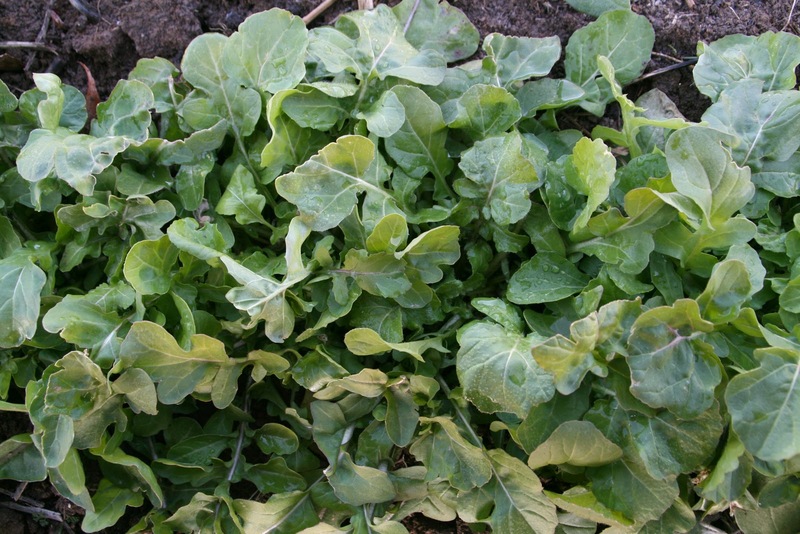 The arugula Grew back amazingly fast since our last market! Brad found this French Breakfast radish that was hidden and grew all summer.